This script is based on Making a Shoutbox with PHP and jQuery from tutorialzine.com. The major difference is we are not using any other libraries just pure php and jquery all the data are stored in a text file. 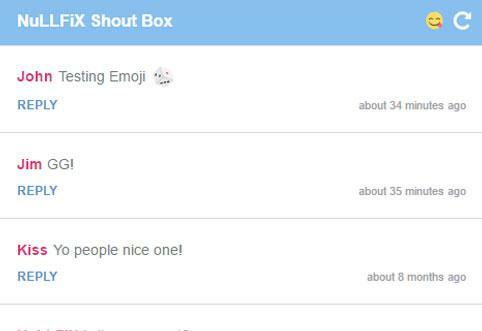 We are going to build a shout box with PHP and jQuery, which allows visitors of your website to leave short comments to one another. Shouts will be stored on the server as a file, no database like MySQL or SQLite will be required. On the client side, we are using plain jQuery code, and the Emoji One library, which is a free project and library for adding pretty emojis to web apps. Just copy the files in a online web server or a local LAMP environment and make sure that the file comments.txt is writeable and you are set!